Palpitations are feelings or sensations that your heart is pounding or racing. They can be felt in your chest, throat, or neck. The heart's rhythm may be normal or abnormal when you have palpitations. Which of these may be a symptom of heart palpitations? The correct answer is all of the above. You may have one or more of these symptoms. The correct answer is maybe. Most of the time, palpitations are not dangerous. Palpitations are only a symptom and not an illness or medical problem. However, heart palpitations can also be a sign of a serious heart problem. Talk to your doctor about your symptoms to be safe. If you're experiencing frequent or severe heart palpitations, how soon should you seek help? The correct answer is immediately. Seek help right away if you are short of breath, have chest pain, feel dizzy, lightheaded, sweaty, or if you just don't feel well. You should also see your doctor if your pulse is beating very fast or feels irregular, or if you have fainted. Even if your palpitations aren't bothering you, make an appointment with your doctor for a check-up. If you're having palpitations, does that mean you have a heart problem? Which other medical problems may cause heart palpitations? The correct answer is all of these can cause palpitations. An overactive thyroid can cause heart palpitations. So can a low blood count (or anemia) -- the heart may need to beat faster or harder when you have anemia. Medicines used for asthma, many cough and cold medicines, and other medicines may cause palpitations. During pregnancy, your heart works harder to pump more blood. Drinking too much caffeine may cause heart palpitations. The correct answer is true. Caffeine excites or stimulates the heart, causing it to beat faster and sometimes causing an extra beat. What else may cause heart palpitations? The correct answer is all of the above. Many people under stress may notice skipped or extra beats. Some cough and cold medicines cause palpitations, as can drugs such as cocaine or amphetamines. Herbs and supplements can also cause changes in your body, including both minor and severe palpitations. If you see a doctor for heart palpitations, will you need tests? The correct answer is maybe. Your doctor will talk to you and check your pulse, listen to your heart, and perhaps perform an electrocardiogram (ECG). He or she will ask how often you have palpitations, how long they last, and what other symptoms you have. Based on the results, you may need blood tests to check for anemia or thyroid problems. You may need a chest x-ray, echocardiogram, or need to wear a device for days or weeks that records your heart rate. What can you do at home to prevent palpitations? The correct answer is all of the above. It's important to get checked by your doctor. The tips mentioned above are steps you can take to help prevent or reduce the amount of palpitations you have. Reducing stress can help a lot. Take some time off, try some activities that you enjoy, and learn how to relax. If stress is a special concern, you may want to get extra support. Normally the heart beats 60 to 100 times per minute. The rate may drop below 60 beats per minute in people who exercise routinely or take medicines that slow the heart. If your heart rate is fast (over 100 beats per minute), this is called tachycardia. A heart rate slower than 60 is called bradycardia. An occasional extra heartbeat is known as extrasystole. Palpitations are not serious most of the time. Sensations representing an abnormal heart rhythm (arrhythmia) may be more serious. Lower your intake of caffeine and nicotine. This will often reduce heart palpitations. Learn to reduce stress and anxiety. This can help prevent palpitations and help you better manage them when they occur. Try deep relaxation or breathing exercises. 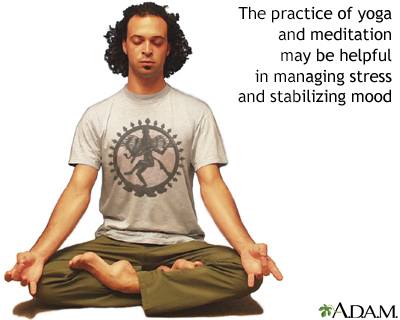 Practice yoga, meditation, or tai chi. Once a serious cause has been ruled out by your provider, try not to pay close attention to heart palpitations. This may cause stress. However, contact your provider if you notice a sudden increase or a change in them. If you have never had heart palpitations before, see your health care provider. You often feel extra heartbeats (more than 6 per minute or coming in groups of 3 or more). You have risk factors for heart disease, such as high cholesterol, diabetes, or high blood pressure. You have new or different heart palpitations. Your pulse is more than 100 beats per minute (without exercise, anxiety, or fever). Your provider will examine you and ask questions about your medical history and symptoms. Do you feel skipped or stopped beats? Does your heart rate feel slow or fast when you have the palpitations? Do you feel a racing, pounding, or fluttering? Is there a regular or irregular pattern to the unusual heartbeat sensations? Did the palpitations begin or end suddenly? When do the palpitations occur? In response to reminders of a traumatic event? When you are lying down and resting? When you change your body position? When you feel emotional? An electrocardiogram will be done. In the emergency room, you will be connected to a heart monitor. Fang JC, O'Gara PT. History and physical examination: an evidence-based approach. In: Zipes DP, Libby P, Bonow RO, Mann DL, Braunwald E, eds. Braunwald's Heart Disease: A Textbook of Cardiovascular Medicine. 11th ed. Philadelphia, PA: Elsevier; 2019:chap 10. Miller JM, Tomaselli GF, Zipes DP. Diagnosis of cardiac arrhythmias.In: Zipes DP, Libby P, Bonow RO, Mann DL, Braunwald E, eds. Braunwald's Heart Disease: A Textbook of Cardiovascular Medicine. 11th ed. Philadelphia, PA: Elsevier; 2019:chap 35. Olgin JE. Approach to the patient with suspected arrhythmia. In: Goldman L, Schafer AI, eds. Goldman-Cecil Medicine. 25th ed. Philadelphia, PA: Elsevier Saunders; 2016:chap 62. The heart consists of four chambers in which blood flows. Blood enters the right atrium and passes through the right ventricle. The right ventricle pumps the blood to the lungs where it becomes oxygenated. The oxygenated blood is brought back to the heart by the pulmonary veins which enter the left atrium. From the left atrium blood flows into the left ventricle. 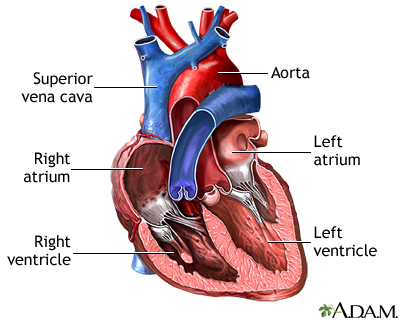 The left ventricle pumps the blood to the aorta which will distribute the oxygenated blood to all parts of the body. Two distinguishable sounds can be heard during the cycle of the beating heart when listened to with a stethoscope. The heart sounds are usually described as a lup-dup sound. These sounds are due to the closing of the valves of the heart. 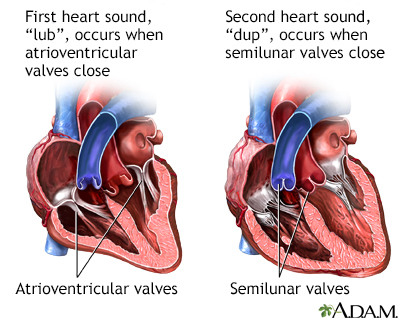 Unusual heart sounds are called murmurs. Yoga is a mind-body exercise which combines stretching and controlled breathing to achieve relaxation and a stabilized mood.